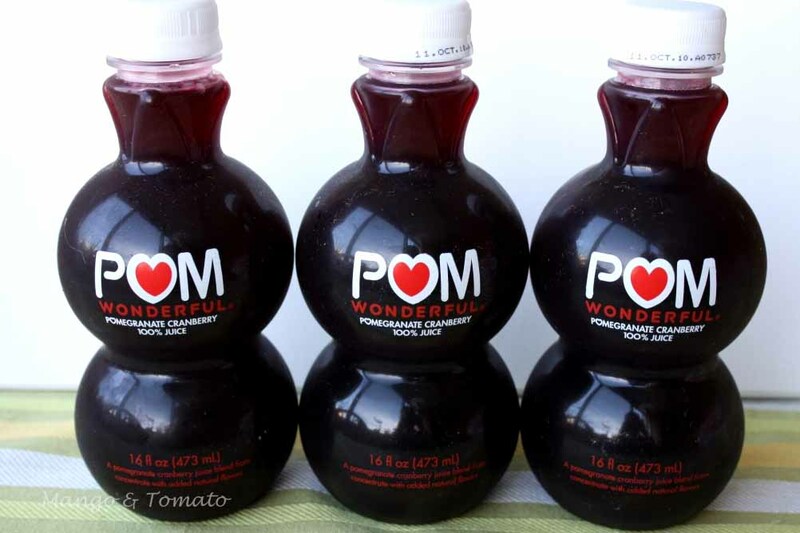 Last Saturday I was pleasantly surprised to receive a package from POM Wonderful, the people behind the pomegranate juice. You see, growing up in Russia, I absolutely loved eating pomegranates, but it wasn't till my family moved to the USA that I tried pomegranate juice. I was smitten. In the past, my favorites were the original pomegranate juice and the cherry one. I am definitely not a fan of the blueberry variety or the coffee one. This time, POM Wonderful sent me six bottles of Pomegranate Cranberry juice that is not even out in the market yet! Yes, I feel very special! The combination of cranberries and pomegranates, both of which are sweet and tart, is absolutely amazing. It makes me think of Fall, Thanksgiving, and I know I'm doing something good for my health while drinking this delicious juice. I wanted to make something special with the juice, although it's perfectly fine to just drink it straight out of the bottle. This time, I decided to do something savory! 1. 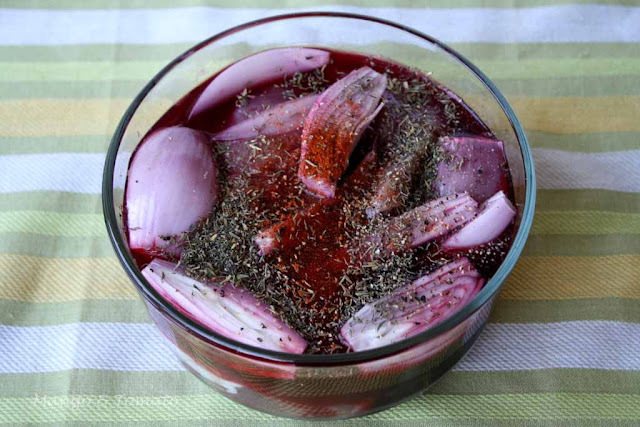 In a bowl combine pork tenderloin, shallots, POM juice, thyme, black pepper and cayenne. 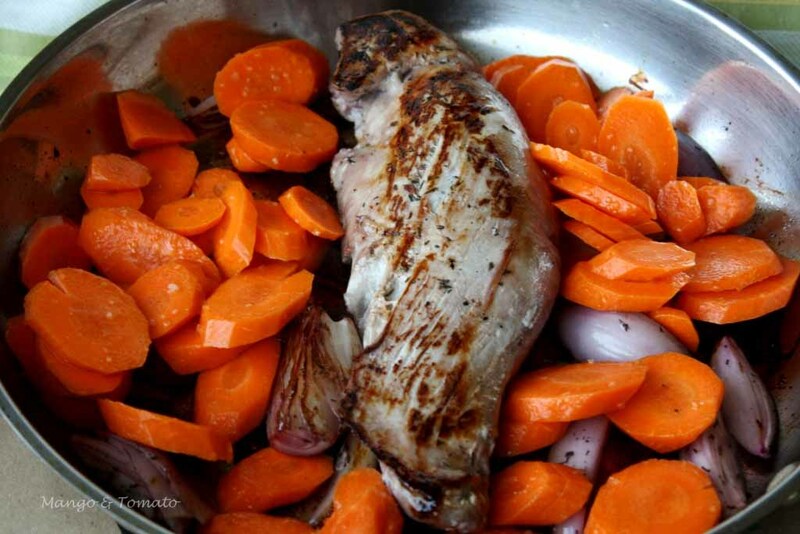 Refrigerate for a few hours or overnight. 2. Remove the pork tenderloin and shallots from the marinade, but don't discard it! 4. In an oven-safe pan, heat a bit of oil. Add shallots and pork tenderloin and sear on each side. 5. 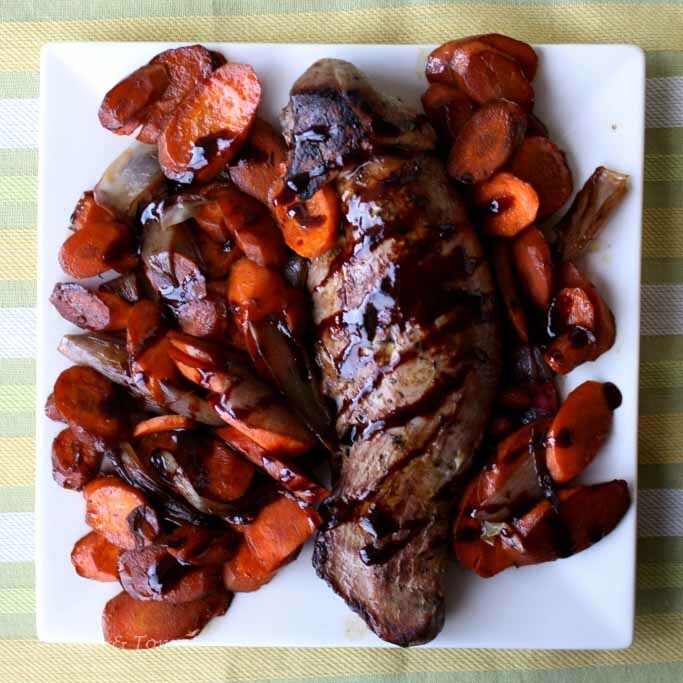 Drizzle carrots with oil, season with salt and add to the pan with pork tenderloin and shallots. 6. 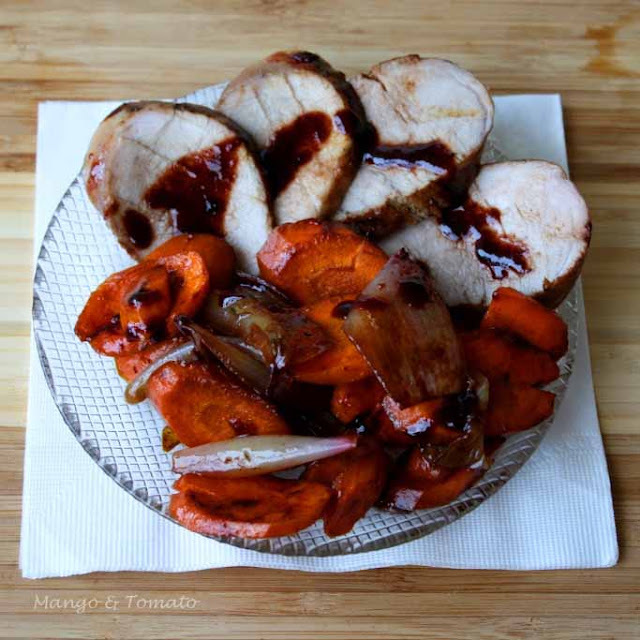 Roast the pork and the vegetables for about 30 minutes (more of less depending on how pink you want the pork to be). 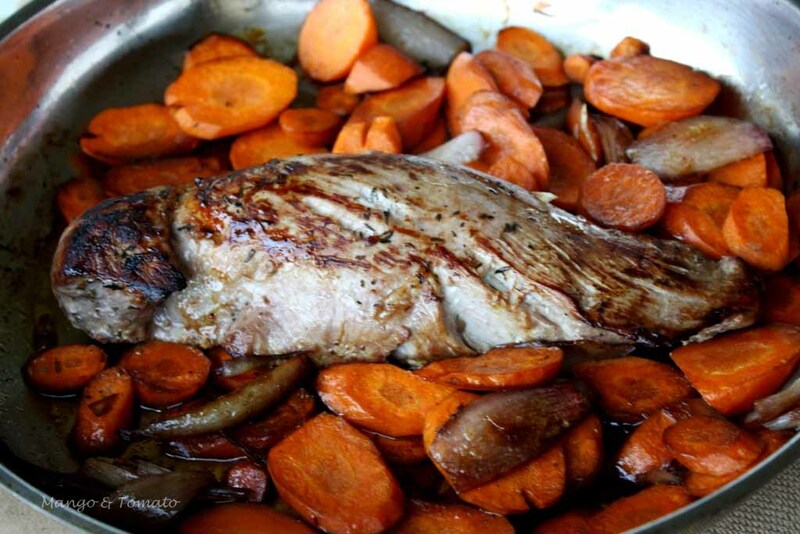 Occasionally, open the oven and spoon the juices at the bottom of the pan over the pork and vegetables. 8. Strain the marinade and add it to the pan. 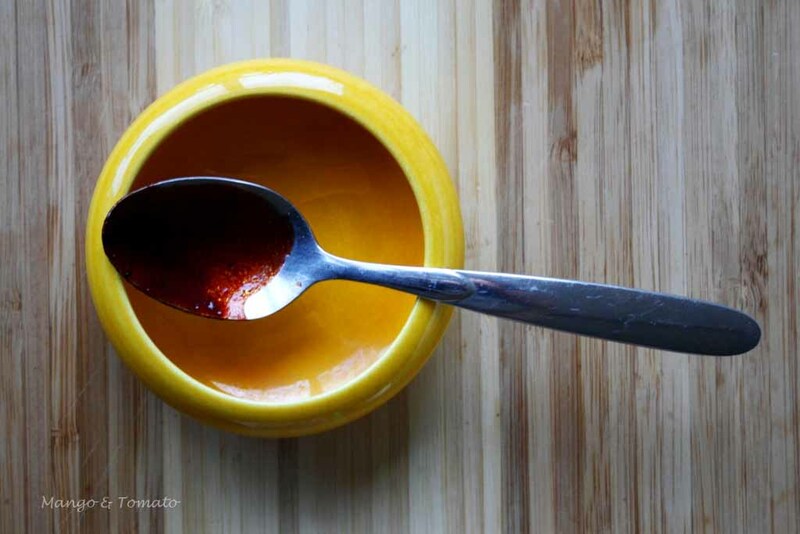 Rapidly boil the marinade until it becomes syrupy. 9. 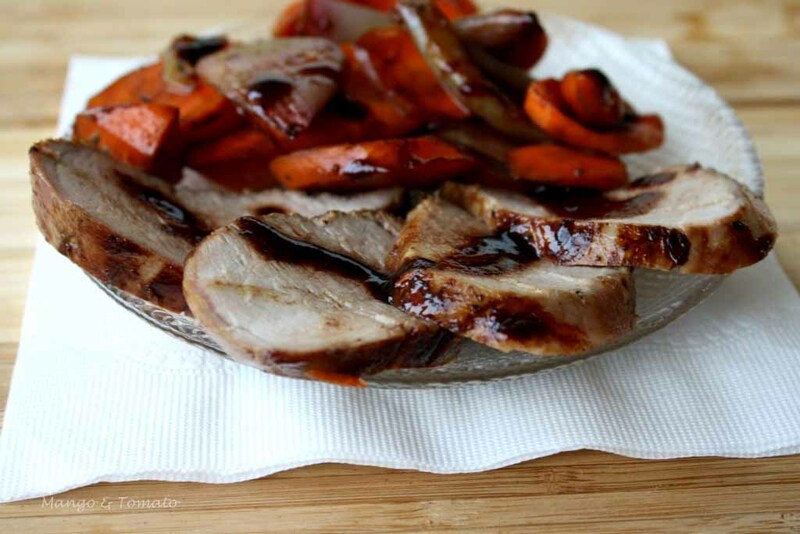 Drizzle the cranberry-pomegranate syrup over the pork, carrots and shallots and serve! This dish is great hot, at room temperature or even cold. I used some of the leftover pork, chopped it and browned it with onions and then added a few eggs: great for lunch or breakfast! Thank you POM Wonderful!!! I will definitely try to come up with a few other recipes using this sweet product. Pomegranate-cranberry sounds like such a good flavor, and it definitely makes me think of fall. This recipe looks fabulous. I tend to like pairing meats like pork with sweet stuff sometimes. Pom-Cranberry sounds like an amazing combination!! 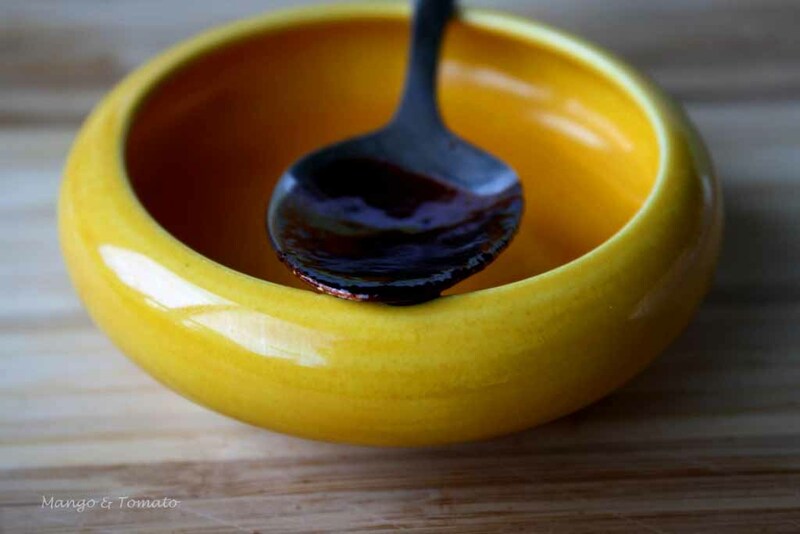 I recently saw that we all of a sudden have pom in the stores here too, so while I am sure this is not there yet; I love the idea of this recipe, so will for sure try it out once I see the same juice in the stores! Excellent idea. It looks delicious. I don't drink juice, but was gifted a case of Pom (no cranberry) juice and didn't have a clue how to use it. I went with osso buco with Pom juice instead of wine. Braised with a handful of dried mushrooms and the dish was rounded out nicely. Inspired by your syrup, I skipped right to it and used your glaze idea on some leftover grilled london broil. Very nice. this recipe looks yummy and simple to bring together. it looks like it would make a lot of food, but i think you could change the size of the tenderloin. pom makes a coffee flavor? i didn't know! i'd be interested to try it. I love this! I'm a porkaholic and this looks delicious.